To all the Hornby Island firefighters and the ones who wait. He’s gone. Out the door, running. To the truck, to the station, to the house on fire. Met by all the others -courageous souls- having left warm beds. Minds woken and run-through with a quickening revision of skills. Flames ahead are not warming; they are not of the candle stick variety. They are a different beast, grown monstrous from pretty ember, from glow to raging live flame. He’s gone. Out the door. And I wait, in the dark. With a sad heart we have had to cancel this year’s Cadet Camp. We only had 10 registrants this year and we need 12 to make it happen. The spring break for this school district didn’t line up with the break for the South Island and Lower Mainland districts. This means that the 6 or 8 kids that have summer homes here weren’t able to attend. Hopefully next year the dates will line up better for us. This year’s Cadet Camp dates have been set and the planning is underway. Kids between the ages of 10 and 14 are welcome to register for the 2 day event which happens on April 4th and 5th. Get more info or register on our website. You can also register by calling the firehall at 250.335.2611 and leaving a message. The Hornby Island Elder Housing Village is a convenient and affordable housing village for Islanders 55 years and older. The society that operates the village relies on the generosity of Hornby Islanders and the goodwill of volunteers to keep the rents as low as possible. Chief LaRose volunteered the better part of a Saturday installing over a dozen fire extinguishers in the dwelling units ensuring that each unit has a working extinguisher. Thanks for your work, Giff. On Jan 5 Al Cannon and I were in Enderby to convey Hornby Island Fire Rescue’s deep sadness in the death of Enderby firefighter Dan Botkin. We marched with over 1100 other firefighters in support of the Enderby Fire Department and a community mourning the tragic loss of one of their brightest stars. The parade wound like a navy blue ribbon through 1KM of downtown streets lined with residents. The only sounds heard were the boots on the street and the pipers at the parade’s head… no cars… no busses… no voices. As we marched, the divisions between volunteer, paid, and auxiliary members melted away and we changed from an assembly to an association. I saw the row of school kids who had been let out to watch the procession holding their colourful sign stating, “We salute our emergency workers” but was too emotional to acknowledge them. Same with the older gentleman who was unable to march but was standing along the route proudly wearing his long service medals. Once at the arena, we entered in single file and filled the auditorium floor while the community members filled the stands. A moving service took place with some particularly powerful words from our Lieutenant Governor, Steven Point and two of Dan’s long time friends. We travelled 11 hours each way in a cramped vehicle with 4 other firefighters, and at times on the way there I was wondering what I was doing it for. On the way home, though, I knew I would be willing to travel twice as far in worse conditions to experience again the pride and sense of belonging that I felt during that parade. 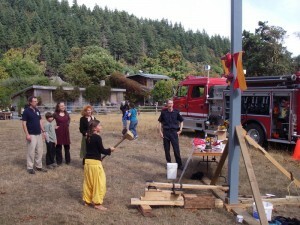 The Hornby Island Fall Faire is the favorite island event of many people. We at the fire department feel that way as well. It’s a great time to show off our #1 engine, stir up interest in joining the department, and distribute some smoke detectors. This year’s faire was even more fun due to Lloyd House’s amazing contribution. Lloyd built a “Test Your Strength” machine, otherwise known as a “high striker” and gave it to us to raise money for our volunteer fund. We offered 3 tries to ring the bell for 1 dollar and raised in the neighborhood of $180! Lloyd’s high striker was a huge hit with the crowd. Big and small and old and young lined up to smash the machine and at times there were 50 or 60 spectators hooting, hollering, and cheering. Huge thanks from us to the Fall Faire organizers and especially to Lloyd House for his incredible high striker machine. That kind of community spirit is what makes us live here. Sure, friends and family are a given but something happened today to make me think of some of the other people who are great supporters of HIFR. 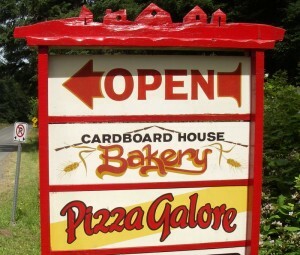 Leslee Richards, the proprietor of Pizza Galour, stopped me at the Co-op to tell me that she had a box of pizza slices in her freezer for the fire department. I stopped by to pick it up and there must have been 10 pizzas worth of slices in the box. Thank you so much, Leslee, for that great donation. There are few things that the crew enjoys more after practice than a slice or two of your pizza. Along those lines, Helene Cregheur, the proprietor of the Cardboard House bakery often has a box of sweets for us to be consumed after practice or callouts. Her cream cheese brownies are my personal favourite and there is never anything left but crumbs when we put them out. Graham and Gloria Herbert almost always drop off a bag of gourmet cookies when they come back from a town day, and Elenora Laffin rarely sends Julian to practice without baking something for the crew. Honeybee Smith shows up every so often with one of her fabulous lemon pies, as well. 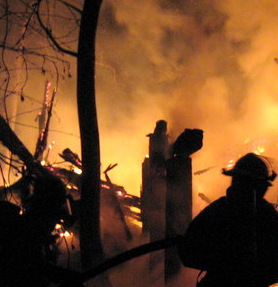 Being a part of the fire department is a huge commitment that comes with the stress of responsibility and many hours spent away from work or family. Often the thought of a Thursday night practice after a long day of work is almost unbearable, but the knowledge that we have the support of the community is very motivating. Thank you to all those that I’ve mentioned above and anyone else that has dropped off food or given us an encouraging word. You are why we do what we do. 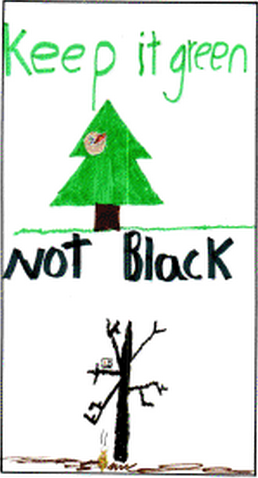 I remembered a wildfire prevention poster contest we had in the school in 2006 for the Grade 3-5 class. The students were asked to draw a poster of what they thought would be a clear and simple message to warn of the dangers of wildfire. The winner of the contest would have their design made into posters, which would be used in a campaign to increase public awareness on the Island and on the Mt. Geoffrey trail system. essence of the impact of wildfires on the forest and the creatures that live there. As modest as ever, Orlando didn’t sign his art and by the time I had all the copies made and laminated and magnetic signs made, it was too late to get his signature on them. You will still see them around; stapled to the trees at trail entrances and on the sides of our department vehicles. I will have new copies made and posted to once again remind everyone of the impact our actions can have on our forests and wildlife. Pat completes another module on his road to becoming a firefighter. Read about it in his latest blog entry.